The Morgan Silver Dollar was struck by the United States Mint between 1878-1904 and then again in 1921. Each year the coins were composed of 90% silver. A total of .77344 ounces of the precious metal are within each silver dollar. Prior to the production of the Morgan Silver Dollar, the United States Mint had not minted a coin of this denomination for domestic commercial transactions since 1873 and the Seated Liberty Dollar. The Trade Dollar was being produced at this time, but it was meant for circulation in the Orient. The United States Mint started producing the Morgan Silver Dollars in 1878 as directed by provisions of the Bland-Allison Act. Under this Act, the Treasury Department was required to purchase between two and four million dollars worth of silver each month to be used in silver dollars. Knowing of the pending Act as well as a personal desire to redesign the silver coinage of the United States, Director of the United States Mint Dr. Henry Richard Linderman requested designs from Chief Engraver Charles Barber as well as from a relative new-comer George Morgan. Morgan had only recently moved to the United States from London after having worked at the Royal Mint. Linderman preferred Morgan’s design and with the permission of the Treasury Secretary it was selected for use on the new dollar. 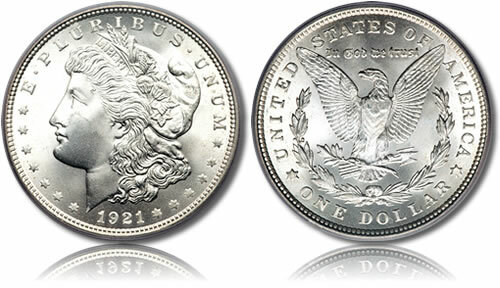 Not surprisingly, the Morgan Silver Dollar takes its name from the designer of the coin, George T. Morgan. The obverse of each Morgan Silver Dollar shows a portrait of a left-facing Liberty complete with the inscription of LIBERTY included as part of her hair band. Also shown are the inscription of E PLURIBUS UNUM and the year of minting. The reverse shows a thin eagle with its wings spread. In the eagles talons are arrows as well as an olive branch. Surrounding the design are the inscriptions of UNITED STATES OF AMERICA, ONE DOLLAR and IN GOD WE TRUST.